Extend the way you think, plan, create, and learn. Build computer support for your mind. Free technology, rapid seminar style training. Learn how to build your new mind extension like a real brain. Gain additional, low-stress memory capacity and much more with your mind’s new layer. Did you know that it is possible to extend your mind with software? Thinking, planning, learning and memory can all be supported with simple, free, visual information mapping software. When set up and used properly, your virtual mind extension helps you avoid losing your best ideas and helps reduce the stresses of information overload. More mental real-estate. Less stress. Set up like a brain. Lives on your computer and can be synced across devices. Since 2010, I have been teaching these ideas to students, businesspeople, city government personnel, medical professionals and scientists. Their testimonials are found here: Additional Testimonials. From developing the ideas while working at UCSD to testing them in my university classes in San Diego, the Technocortex training is now my favorite mini-class (3 hours) to teach. It is instantly useful and can have lifetime impact. Clients use it for anything that requires thinking, planning, learning, organization, focusing attention, and memory. Your electronic mind-extension is a convenient single location for much of the information you need throughout the day including the little bits of information you are always looking up (websites, contact information, logins, passwords) and your biggest ideas for strategy or for life’s wisdom. Speed is of the essence in today’s world, so why waste your mind on tasks or bits of information that are better represented in your digital mind? I created this program to help any person leverage brain science and software to improve the quality of life. As a research scientist (University of Arizona and UCSD), I have over a decade of personal experience understanding brain function and am passionate about helping motivated people put neuroscience to work in daily life. What are clients saying about the training? Rapid initial training (3 hours in-person or online) allows you to immediately use the system to naturally support your thinking and daily work. Every day you generate ideas that are worth capturing before you lose them. Every day you require fast access to a wide range of information, and need to manage many different projects from small and quick to large and long-term. Your Technocortex is designed to help you do all of this more quickly, with lower stress, and with greatly improved memory. In every personal training session, Dr. Greenberg has seen clients use their Technocortex to retrieve important yet forgotten ideas, recall important conversations, and rapidly switch their minds from the little details to the big picture, and back. People even benefit from rapid retrieval of simple information like logins and passwords. Every efficiency matters because slow downs and interruptions compound to create the days you “get nothing done”. Therefore, workflow support is a primary benefit from brain-based visual information management. Set up like a real brain and growing with use, this brain-based thinking and information management tool expands as much as you need to fit and support your best ideas and most important projects. We focus on how it supports learning, memory, attention, along with handling nearly all information (data, knowledge, and wisdom). With memory, the focus is on how improved encoding, storage, and retrieval of information helps you increase speed and lower stress. You will also see how it helps you reduce the stress of information overload and the time losses due to distraction. To make this training feasible for very busy people, you can schedule your training in 90 minute segments. To those who say they are too busy to learn anything new, the answer is simple. Call when you have had enough pain. People usually schedule an appointment right away after hearing this because they have been feeling the pain of work overload for a long time. Like all tools and practices for the mind, Technocortex is a form of awareness practice/training as is meditation, yoga, or any other discipline that both trains and strengthens the mind/brain. Unlike all of the other methods, with your Technocortex, your brain/mind isn’t doing all the work and you can drop it and come back to it with almost no loss of information or skill. 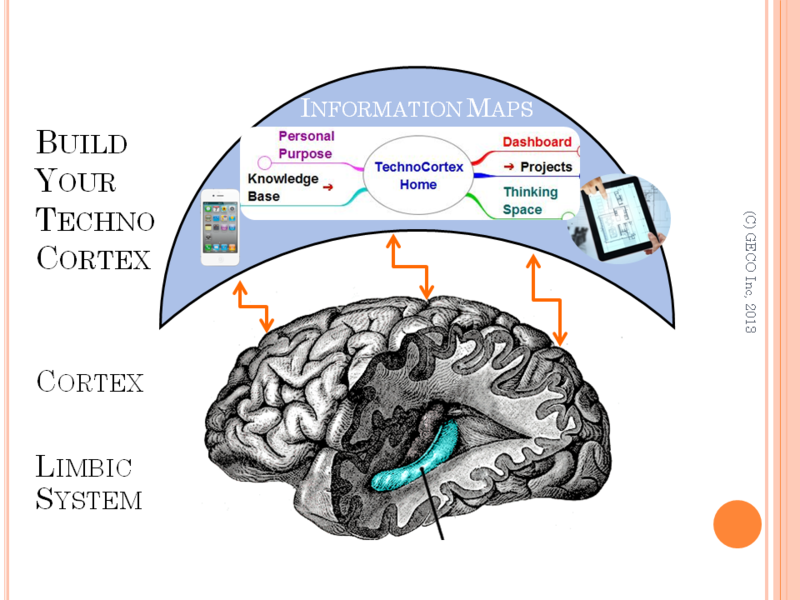 The ability to rapidly reboot your mind by taking a walk through your information maps is just one way to leverage computer assisted thinking in daily life. The principles you learn will apply to any possible future information mapping software meaning that your training here is both specific enough so that you can immediately start using your system, and general enough that you’ll understand what it means to efficiently work with information and knowledge. Your brilliant mind can be used to store the grocery list and gossip about trivial matters (a waste), or you can use it to develop cures for cancer (preferred). Whether you are a CEO, project manager, scientist, lawyer, writer, or student above the age of 10, neuroscience knowledge can show you powerful new methods of personal and professional achievement. If you are a motivated person who respects your own ideas, then you deserve a platform to help your mind achieve these long-term desires. The human cortex is the multi-layered covering to your brain that houses most of the neurons (cells) that process and store the information that makes you the person you are. The cortex is nature’s answer to the question of how to move/navigate successfully and create flexible, adaptive, and creative behavior that integrates a lifetime of experience. It creates your perceptions, actions, memory, personality, and more. Each region does something different and to function, they must be properly connected using short and long range axons (the wiring of your brain). It thickens/grows with learning and shrinks with disuse, disease, or damage. It is also largely devoted to movement and vision, yet in the history of human evolution we have grown large regions of “association cortex” that give us the powers of abstract thought, reason, language, music, imagination, and more. These regions of association cortex and their functions are the ones we will support with your technocortex. Computers have literally given us the capacity to evolve our minds outside of our brain so the definition of the word “mind” may need to change as we increasingly blend body and machine. Brain-Computer Interfaces were pioneered in the days of electrical stimulation for pre-surgical brain function mapping (this tells the surgeon what not to remove) and electrical implants to control behavior. Jose Delgado in the 1950s would stop charging bulls with small shocks delivered by wire into its hypothalamus. Today, BCI’s use similar mechanisms but with better equipment to implant electrodes inside or on top of the head, record electrical signals, decode them, and send signals back into the brain. Recording and stimulation is relatively old, but decoding the signals to predict or control precise movements or decisions is quite new. Some BCI’s are used to reduce the symptoms of Parkinson’s disease while others like retinal implants aim to replace damaged neural tissue with mechanical visual sensors that also successfully connect to our nervous system. Much more than pacemakers or remote controls for the brain, we can now use computers to actually interpret brain signals for their true meaning. In spite of this, very little of this technology does anything for you in your daily life. Because we can emulate some of these functions using software, and start using this immediately I started teaching the ideas of creating a Technocortex – your virtual mind extension. A) How we can improve learning, memory, and attention within the information overload age. B) How to deal with the fact that we can generate ideas far faster than we can act on them. Having built physical brain-computer interfaces (BCIs) for my doctoral research at the University of Arizona in 2004, I know all about BCIs and that you can make your own virtual BCI as a project, achievement, and thought enhancement system. Your training system includes the tools and techniques. To show people how to begin, I created an in-person and online training program. Years later, our first clients are using their systems, growing them, and showing others. This is not taught anywhere else, so please refer back to this website for offerings and updates. Nearly anyone can start using the Technocortex for anything that requires thinking, planning, organizing, and remembering. Because we live in the information overload age, your external brain (Technocortex) is very useful for working with both the big picture and all the little details. I recommend the program for motivated students and professionals of all ages who want a competitive advantage. Consider this – can you afford to lose most of your ideas and thoughts, or would you like a way to learn and develop your projects/skills that safely collects your most important information and best ideas? Most people back up their hard drives, but who backs up their brain? If you’ve been to college, you know what it is like to lose the majority of your ideas and information. This is not necessary, and beyond supporting learning and memory, we also focus on using the Technocortex to direct/focus attention and recover from distraction. So, if you have a brain and respect your mind’s work then this training is for you. Obtaining the training is easy. Email paul.greenberg@gogeco.org to schedule your in-person or on-line training. During in-person seminars in San Diego, we use visual information mapping software (Freemind, Mindmeister.com, and others) to create a virtual extension of your mind that lives on whichever computer systems you use most often. The brain is our guide both in terms of structure and function. With my 10 year training in By supporting your brain’s strengths, minimizing its weaknesses, and minimizing the impact of our fragmented, interruption heavy information overload age, you can gain a wide variety of personal and professional benefits. Created for people living and working in the information overload age, one of the main goals is to help you more rapidly manage all of the mundane yet necessary details in life/work so that you have more time to spend on your higher purposes. As you spend more time working on your most important and meaningful projects/goals, your technocortex is perfectly suited to helping you capture and build upon all of the thoughts and new information you will need to achieve your goals. Through simple and natural daily use, your system grows into a representation of and a resource for your top projects and ideas. One unique situation of being a human is that we can quickly overproduce ideas and our memory simply cannot keep pace. The Technocortex is a unique solution to this storage and memory problem because if you simply capture (and map) your ideas as they happen you end up with a very good memory for some of your brain’s most valuable work. Because many people want simpler answers to more immediate problems like information overload or forgetting, the Technocortex is also your way to create reminders, streamline your work flow, reduce time spent looking for things, and to reduce the impact of distraction. Because the world changes faster than our brains evolve, we will use technology as a method to add capacity without waiting. While we first focus on your short-term, project specific needs, a prosperous future depends on your long-term plans and years of focused and steady effort. Therefore, you will also learn how, when, and where to collect and develop your best ideas across your lifetime. With these simple practices you will be able to create a flexible information and memory system that no previous generation has deployed. Start now by emailing Dr. Paul Greenberg with a “Training Information Request”. If you could quickly build an extension to your mind, would you? This is quite possible yet few people consider it and fewer still know how. Even while we use smartphones, laptops, spreadsheets, databases, websites, email, and all manner of devices and software to collect, store, process, and retrieve information, these are not optimized for your mind, and it is very easy for everything to be scattered and messy. The greater the scatter, the longer it takes to find and use. In spite of this, it is easy to learn visual information management software and information management habits that ARE much more supportive of your brain and that are designed like the brain with efficient layers and synapses (connections / hyperlinks). Neuroscience shows us how the brain works and when we use these principles to tell us how to work with information, you create a system that is fast and ergonomic to the way that you think. Using this system also changes (improves) the way you think. The famous author, R.B Fuller said “If you want to teach people a new way of thinking, don’t bother trying to teach them. Instead, give them a tool, the use of which will lead to new ways of thinking.” By considering how you view the world and while naturally improving your organization and problem solving, you strengthen your critical thinking abilities. This quality is deliberate because when deciding where information is most useful to you, you end up asking important questions about both the big picture of everything you are doing as well as considering all the little details you need to take care of for any project. Why Upgrade & Learn New Skills? Imagine what it would be like if you and your team were more efficient, could better handle information overload & distraction, and found it easier to learn and remember. What is your system right now, compared to what could it be? Using the neuroscience of learning, memory, and attention, we help you build your own Technocortex to suit the way your brain works. We live in the information overload age, so why not give yourself an edge? Clients use the software based Technocortex to support all other formal and informal learning. Make it easier to Capture, Organize & Store, then Retrieve & Use any information or ideas that help you and your team achieve. GECO Inc, a training and development services company, helps you accomplish two things – Learn & Apply New Ideas/Skills and Build your Capacity to do this independently. Make this all easier in the information overload age. Easier to learn, easier to remember. **Training is more effective when you first make it easier for the audience to learn. **Training benefits last longer when you make it harder to forget. The only thing that exceeds our capacity to learn is our capacity to forget. This is biological. There is far too much information in the world to store, so the brain has efficient filters and forgetting mechanisms. This is great for the brain, but reduces the lasting impact of training/education. Here, we provide software and concepts that will help you more effectively Encode, Store, and Retrieve the new information you either seek by choice, or just need to handle at work. We use computer support because there is too much information for anyone to handle. Because we all need to be selective with our time, the first principle of our learning system is the same as the rule for speed reading – don’t read or learn anything you don’t want or need. Wise topic choice. The second key is to protect your investment. Once you’ve seen the value and invested your time, be sure you protect that investment by capturing the information within your Technocortex. Naturally create a fast memory and idea-generation system that makes creative behavior more likely. Want to reduce the time within an innovation cycle? Make it easier to remember and connect the dots in a brain-friendly, visual format. Hands on software training – You will be able to use your system during the course and when you go home. You will understand and implement a variety of techniques to immediately increase your efficiency or productivity in daily life. Stage 1 is to help you clear your plate so that you can find the time for Stage 2 – building capacity and longer-term plans. Your tools, goals, and the training allow you to assemble your personally tailored thought-support system (a virtual Technocortex) that gives you extremely good support with learning, memory, attention, project management, personal/professional growth and more. Tools are nothing without you and your ideas, so we help you identify goals & manage your immediate projects & concerns. In short, you get a simple, direct, hands-on, *use for the rest of your life* type of training. – Methods to collect & process ideas that, when used as instructed, WILL help you increase your abilities for creativity and problem solving. Group Training Price: 150 USD per person. Bring a friend or partner free. Individual Training Price: 275 USD per person. Bring a friend or partner free. * Enquire about discounts for Action Coach San Diego, Brandman University, University of San Diego, Argosy University, the East County Chamber of Commerce, Barrio Logan College Institute and Rotary Club members.